Chiang Mai has a large Muslim population. Walking around one day I came across a predominantly Muslim neighborhood with a day-market in progress. This is a picture of some of the wares of a meat vendor. It's a duck! See it? My first reaction was: is that a baseball glove? Then I saw the duck's head. It's a dried duck, boned and sun-dried whole. I spoke to the seller, it was pretty expensive too. This one was about three pounds (one and a half kilograms), and it would sell for almost five hundred Baht (fifteen dollars). I showed this picture to a friend of mine and she said that she hadn't seen a dried duck like that for forty years. Back when I was complaining bitterly about that other blog that was getting over eight hundred hits a day I suggested that I didn’t really care, I really only wrote this thing for myself, and the readers were just gravy. Suggested disingenuously, I think. Because I do care. Why would I do all of this work, over all of this time, just to achieve some settling effect on my own misguided temperament? No, it goes deeper than that. Upon reflection, I think that I do it in some hopeless striving for approval. That’s something that most people want, some more than others I suppose. I’m no Dr. Phil, I lack even pretend credentials for that status. I’d probably deny that the approval of strangers was important to me, but I’d be wrong. Why am I a big tipper? Would I suggest that it’s because I appreciate the service? Maybe. Do I do it, as I sometimes say, because it’s the only place that you can buy a smile so inexpensively? No, I want the approval. I want the taxi driver to go home and tell his wife, I had a nice Farang today, he gave me an extra thirty Baht, spoke okay Thai too! I’ve always been a big tipper, I think I got the bug when I was a taxi driver myself, long ago and far away. People who gave me a larger than expected tip immediately went on the good list. I want to be on people’s good list. It’s illusory, though, and ineffective for the stated purpose. I’m a shameless flatterer too. Here’s a big smile and a compliment! Love me! “Misguided” applies to this blogging attempt to gain approval too. More readers does not equal approval. That other blog gets a lot of comments on every post, but lots of them are complaints about her politics. She does get a lot of good-for-you, though, and some you-go-girl! too. I love comments like that, I run to the computer in the morning hoping to find one. How little I understand these things. And what a colossal failure I have been in accumulating real approval. Earnest but misguided, that’s me. Now I’m begging, and that’s not polite. So accept my apologies, and don’t feel obligated to say something nice in a comment. Enjoy the pictures! 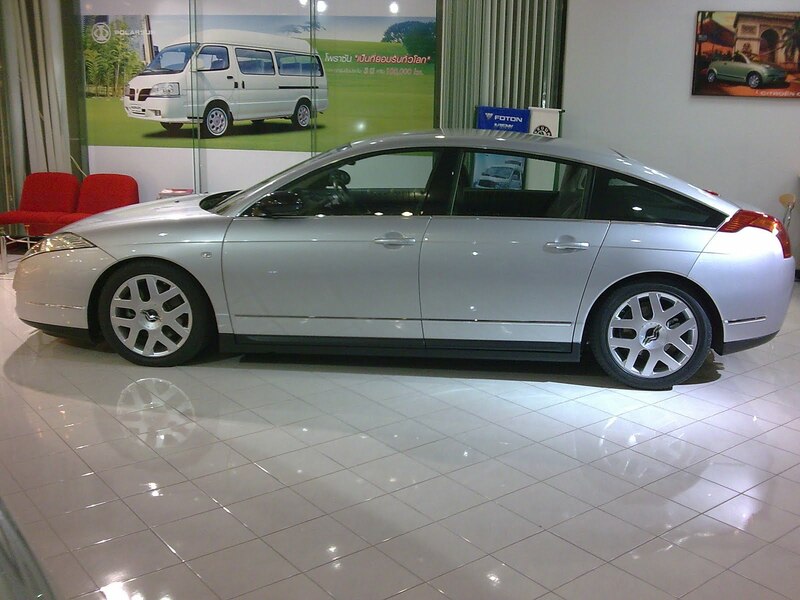 Yantrakint Motors has a small display space in the Mall Bangkapi, my local mall. They sell a weird array of off-brands: Skoda; Proton Star (China); Citroen. 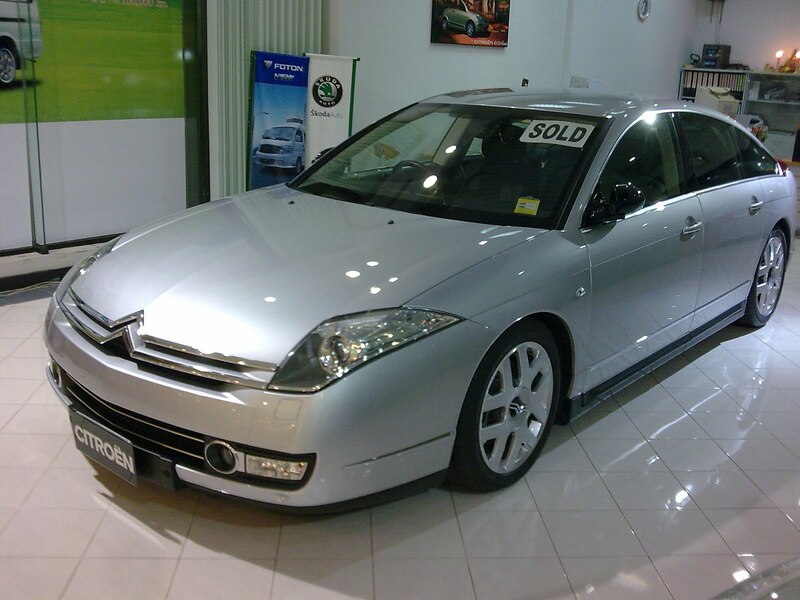 This beautiful, if impractical, Citroen was selling for four million Baht (about $130,000). Honestly, I can't imagine anyone wanting to buy the thing, it would be a maintenance nightmare. This one was "sold" though, proof that everywhere you go there are people with more money than common sense. 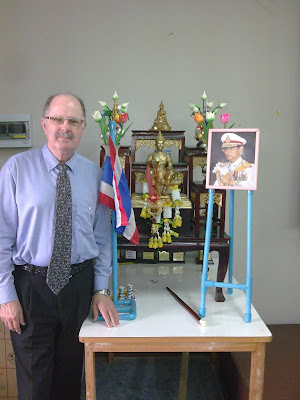 Labels: "Citroen" "Thailand" "Mall Bangkapi"
A student was kind enough to take a picture of me at the classroom's shrine to the King. I was very interested in the use of "the ubiquitous blue PVC pipe" as a framing medium for the King's photo and the flag. This pipe is all over Thailand, used for a million purposes. I've seen it turned into a golf club; attached to a roof with metal tubing attached for use as a TV Aeriel; eighteen inches of a large gauge piece with the house address written on it used as a mailbox. It always makes me smile. Labels: "Thailand" "Blue PVC Pipe"
Ooops! I found another cat! I'm pretty sure that this exhausts my supply. Note, however, that this one is dressed up as Santa Kitty. Labels: "Cat Will Wear Costume For Food"
Okay, people want cats. This is all I have on hand. They may not look like much, they look very much like Tabby next door, but they are much bigger and they live in the jungle. If only I could have dressed them up as Batman and Robin. But at least it's cats. Labels: "Cats" "Chiang Mai Zoo"
This has to be a rare bird. It looks to me like a grey-market luxury variant of the Galant series. Those mirrors way out on the fenders are a dead giveaway that the car was originally destined for the Japanese market. The whole thing was a nice presentation. High style all around, including the interior. Ever seen one? I've been visiting the blog of another failed California lawyer. I came across a link to it somewhere, a post in which she was asking for money to avoid being kicked out of her apartment. The first thing I noticed was that there were about thirty five comments on the post already. Many were from regular readers who talked about pushing the Pay Pal button this instant. Wow, I thought, this ordinary looking blog has real legs. The writer sounded like a nice enough woman, but a little weepy. There was a site mapping button, so I pressed it. The blog gets over eight hundred visitors a day!!!! What magic was at work here? Whatever, I couldn't face making a real reportorial effort regarding substantive issues on an almost daily basis. So I guess I'll content myself with you faithful double-dozen and consider myself lucky. What about them temples!!! Who loves you!!! Chiang Mai Zoo: Alert The Media! Lin Ping Awake! Usually my sightseeing in Chiang Mai is limited to temples and Italian restaurants. I branched out a little this time and took in the Chiang Mai Zoo. The Panda in the picture is the famous Lin Ping. She was born at this zoo, and seems to be thriving. She's one of Thailand's biggest stars, she has her own TV channel, all Lin Ping, all the time. Usually she's sleeping, but I was lucky enough to find her quite active, including this nice goofy pose. Labels: "Chiang Mai" "Pandas" "Lin Ping"
This is my favorite temple in Chiang Mai, Wat Buperam. It's a very old, prosperous temple. The decorative motifs are elaborate inside and out, and all beautifully done. There are lots of mythical creatures around the outside (one is pictured). Included are pictures of the main alter (with the windows on both sides) and one side alter. This is a "north, south, east and west" temple building, with alters at south (main), east and west. Labels: "Chiang Mai" "Thai Temples"
This is a very nice teak wood temple in Chiang Mai, Wat Pon Taow. There aren't many of these teak temples left, this may be the best of them. It has been closed for years for renovation, but I was lucky to find it re-opened on this trip. The little "Spirit House" is outside the front door of the temple. I'm not an expert, but I think it's unusual for a temple to have a Spirit House. Most houses and businesses have them, they're dedicated to the spirits of the property, the spirits of ancestors, and the higher power in general. Watched some Al Jezeera and some Fox News over the weekend in my Chiang Mai hotel. Interesting stuff. Al Jezeera is nice presentation, altogether subtle and apparently neutral. Sometimes, rarely, a gentle agenda can be seen. There was a lot of coverage of a commercial plane crash in Iran. It was an ancient Boeing 727, more than forty years old. Al Jezeera did dwell with artfully concealed glee on the reason that Iran was still flying these ill-maintained death traps. The American led embargo, of course! Since 1979 it has been hard for Iran to buy new planes or spare parts. This is an explanation, but it is not an excuse (a distinction that judges like to make when you try to explain a problem with your case). The embargo is a reason for them not to have new planes, but it does not excuse them for having sent people up in these tired old things. Fox News is always entertaining, especially if you enjoy getting very angry. This weekend the big news was the shooting in Arizona of a congresswoman and lots of other people. Boy, that was one talented shooter right there, what a score he ran up! If he had practiced reloading more diligently he could have set some kind of record. He’d been complaining about the whole “Big Government” thing on the Internet, bitching about immigrants and “ignorance,” Jews, and “them.” He belonged to some kind of organization, “American Renaissance” or something. Where have I been hearing stuff like this for years? Fox News immediately went into heavy damage-control rotation. The kid, they said, was obviously a lone nut job who could not have been influenced by political rhetoric because of his insanity. Geraldo called the shooter a “drug-addled lunatic,” based on the fact that he had failed a drug screening when he tried to join the Army. It was reported that he had attended a rally for the congresswoman in 2007, offered as proof that he could not have been influenced by the last two election cycles. With their best straight faces on, the Fox news readers reported that “the Left” was trying to make political capitol of the incident by claiming that “Conservatives” were somehow to blame. This painfully obvious deluge of exculpation only drew attention to the connection between this shooting and things like, “lock and load,” targets superimposed on politician’s faces (including that of this congresswoman when Sarah Palin targeted her for defeat by a Tea Party candidate), “don’t retreat, re-load,” and the nonsense about Second Amendment remedies. Not to mention the lurid conspiracy festival that is Glen Beck, et al. I’m glad that I don’t have daily access to Fox News, but it’s okay sometimes to be angered by them. The faces they make! So earnest, so heartfelt, so desperate to appear intelligent. If it weren’t all so dangerous, it would be funny. I'm up in Chiang Mai for a few days, teach a class and work in a little R and R too. Back with some notes and pix later in the week. The recent demise of Don Van Vliet, better known as Captain Beefheart, got me thinking about the different styles of some of our beloved bandleaders. Some are low-key; some are martinets; some seem to have been truly terrifying. There doesn’t seem to be a reliable correlation between overall personality and band leading style. Certainly the Captain was a very nice man, a gentle soul, but from all of the reports that I’ve seen from his band mates he was ultra-demanding with his musical general’s hat on. I don’t know if he fined them for transgressions, but my impression is that he had what diplomats call “very frank exchanges” with them if their toes weren’t placed properly on the white line of his reality. Jimi Hendrix was a nice man too, but his style seems to have been just to tell them, “try to keep up.” His style matched his personality. I’m sure that he remembered those days traveling with the Isley Brothers, who obviously tried to make back as much as possible of the band’s salaries from fines for everything from scuffed shoes to being out of tune (what’s a poor guitar player to do? Those things are inherently out of tune, they’re built that way). James Brown, of course, is the prototypical martinet. Famous for fines and firings, he ran a tight ship, two hundred dollars a week and you’ll play all of the shows and recording dates that I can line up, and you’ll like it. I always thought that he should have fined himself for his organ playing and given the money to the band for putting up with him. I know he would never have hired himself to play the organ, no way. It all goes together though, he was the boss, no half-stepping, no back-talking, no looking back. What was Miles like? How about ‘Trane? Ray Charles? Ray kept some great players close to him for many, many years. I think that’s probably a good sign. The only thing I recall Ray’s musicians complaining about is that Ray liked to play really slow sometimes, they called it “the Death Beat.” That can be tough. They stuck around though. What kind of bandleader are you? YouTube is like life in the big city: when you turn the corner, you never know what you'll find. This is some deep, deep stuff right here. Field music, like the fife and drum pre-blues music, no chord changes, call and response structure. Frankie Lee is from Texas, not that it matters. He belongs to the world now. By the way, anything on Ace Records is probably great, the odds are good. How can something like this be up for a year and a half with only 2,300 hits? Miley Cirus gets that every couple of seconds, and if I told you what I thought of her music I'd probably be arrested. I'm right too! January 1st is my Asian birthday. It is also my Facebook birthday. My other birthday, the anniversary of my birth, is in Summer. Maybe I'm paranoid about identity theft, but being paranoid doesn't mean they're not chasing you. Secrets on the 'Net? Not likely, but one can dream. Avoiding the status of "low hanging fruit," of becoming easy prey, is always a good idea. The Asian connection: there are two, distinctly non-Western birthday ideas at work here. In some places, you are one year old on the very day that you are born. So on the first anniversary of your birth you turn two. It is the second time you have been alive on that day, after all. In other places, everyone turns a year older on January 1st, like me on Facebook. So whatever day you were born during the year, you turn one on the first of the next January. Thanks to all of my Facebook friends for the birthday wishes! I shamelessly accept all kind words.